Across the world education for 'thinking’ is seen as the key to thriving in an increasingly complex, globalised, technological world. The OECD suggests that teaching thinking is key to growing a more successful economy; others claim it is needed for increased democratic engagement and well-being. Theory of Teaching Thinking discusses what is meant by ‘thinking’ in the context of teaching and takes a global perspective incorporating contributions from neurocognitive, technological, Confucian, philosophical, and dialogical viewpoints. how can thinking be taught? what does ‘better thinking’ mean, and how can we know it if we see it? what is the impact on wider society when thinking is taught in the classroom? Extensively researched and at the cutting edge of this field, this book provides the context for teaching thinking that researchers, teachers, and policy-makers need. As the first book in a brand new series, Research on Teaching Thinking and Creativity, it is a much-needed introduction and guide to this critical subject. ​Dialogic Education builds upon decades of practical classroom research to offer a method of teaching that applies the power of dialogue to achieving conceptual mastery. Easy to follow template lesson plans and activity ideas are provided, each of which has been tried and tested in classrooms and is known to succeed. Wider dialogues: Educational adventures in the conversation of mankind. Written to support all those in the field of Primary education, this book will be an essential resource for students, trainee and qualified primary teachers interested in the educational importance of dialogue. Wegerif, R, Li, L and Kaufman, J C (Eds) (2015) The Routledge International Handbook of Research on Teaching Thinking. New York and London: Routledge. The Routledge International Handbook of Research on Teaching Thinking is a comprehensive guide to research on teaching thinking. Teaching thinking is key to growing a more successful economy, is needed for increased democratic engagement and is vital for the well-being of individuals faced with the complexity of a globalised world. However, there are questions about what we mean by ‘thinking’, how best to teach it and how best to assess it, and it is these questions that this handbook explores and addresses. Including numerous strategies ready for adoption by interested teachers, the book addresses the varied cultural factors that influence engagement with science education. It seeks answers to the question of why increasing numbers of students fail to connect with science education in schools and looks at the more subtle impact that students' individually constructed identities have on the teaching and learning of science. Recognizing the diversity of its audience, the book covers differing levels and science subjects, and examines material from a range of viewpoints that include pedagogy, curricula, teacher education, learning, gender, religion, and ICT, as well as those of in-service and trainee teachers at all levels. Dialogic: Education for the Internet Age argues that despite rapid advances in communications technology, most teaching still relies on traditional approaches to education, built upon the logic of print, and dependent on the notion that there is a single true representation of reality. In practice, the use of the Internet disrupts this traditional logic of education by offering an experience of knowledge as participatory and multiple. This new logic of education is dialogic and characterises education as learning to learn, think and thrive in the context of working with multiple perspectives and ultimate uncertainty. The book builds upon the simple contrast between observing dialogue from an outside point of view, and participating in a dialogue from the inside, before pinpointing an essential feature of dialogic: the gap or difference between voices in dialogue which is understood as an irreducible source of meaning. Each chapter of the book applies this dialogic thinking to a specific challenge facing education, re-thinking the challenge and revealing a new theory of education. The challenge identified in Wegerif’s text is the growing need to develop a new understanding of education that holds the potential to transform educational policy and pedagogy in order to meet the realities of the digital age. Dialogic: Education for the Internet Age draws upon the latest research in dialogic theory, creativity and technology, and is essential reading for advanced students and researchers in educational psychology, technology and policy. "An essential addition...Wegerif zooms in on the most important ingredient of all in a learning-to-learn classroom culture - the kinds of talk that are allowed and encouraged - and brings together both scholarly and practical approaches in a highly fruitful and accessible way." There is growing interest in developing flexible thinking and learning skills in the primary classroom but there has been little agreement as to exactly what these skills are and how best to teach for them. 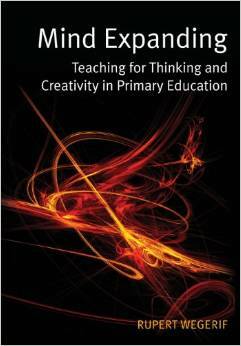 This innovative book responds to that challenge with a coherent account of what thinking and creativity are and how they can be taught. Taking a 'dialogic' approach, it shows how engaging children in real dialogue is possible in every area of the curriculum and how this can lead to more reflective, considerate and creative children who are able to think for themselves and to learn creatively. Wegerif explores the success of approaches such as Philosophy for Children, Thinking Together, Dialogic Teaching and Building Learning Power. Using illustrations and activities, he explains how teaching and learning across the primary curriculum can be transformed. This book is important reading for all primary teachers and trainees who are looking for practical ideas for teaching thinking. It will also be valuable for anyone who wants to understand education and think more about what is most important in education. Wegerif. 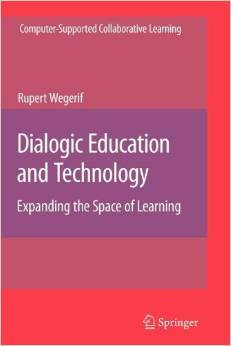 R. (2007) Dialogic, Education and Technology: Expanding the Space of Learning. New York: Springer-Verlag. This book empowers people to go beyond themselves into new spheres of learning, thinking and creativity. Drawing on recent work in communications theory as well as psychology, computer science and philosophy, it reveals some key characteristics of learning dialogues. It also demonstrates ways in which computers and networks can deepen, enrich and expand such dialogues. The book's central argument is that this dialogic perspective in education and the latest developments in information and communications technology make ideal partners. Based on an independent organisation working with teachers, learners, parents, and community groups. 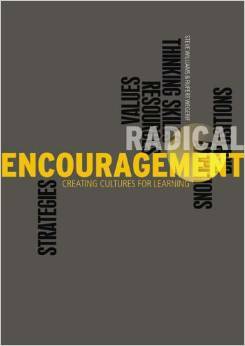 This book is for education professionals involved in creating positive cultures for learning in schools and communities. Wegerif, R. And Dawes, L. (2004) Thinking and learning with ICT: raising achievement in primary classrooms. London: Routledge. * using group discussions as a way of improving general communication, as well as thinking and reasoning skills. 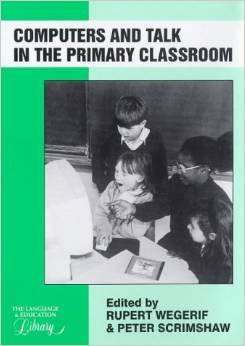 The approach is to use computers as a support for collaborative learning in small groups and this book presents ways to prepare pupils for talking, learning and thinking together around computers. Excerpts from pupils' discussions illustrate the main issues and guidance on lesson planning and developing and choosing appropriate software is also provided. Thinking and Learning with ICT will be a valuable resource for primary teachers and student teachers. This title presents a programme of activities for developing speaking, listening and thinking skills for children aged 8-11 (Second Edition). In today's full curriculum, there is only so much time teachers can devote to the development of language and reasoning skills. Thinking Together has been specifically designed to develop the language and reasoning skills of children at Key Stage 2. This invaluable book includes activities which have relevance to English, mathematics, science and citizenship. A key element of the Thinking Together approach is exploratory talk, which can help children improve their critical thinking and reasoning. 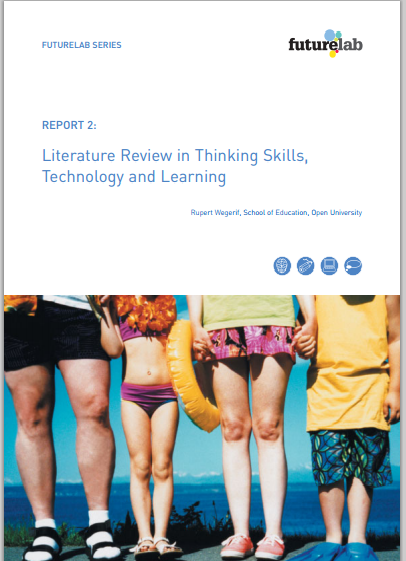 This review examines the role of technology in supporting the teaching of thinking skills, summarising research into the use of technology as a 'mind tool', as a tutor and for developing collaboration and communication.